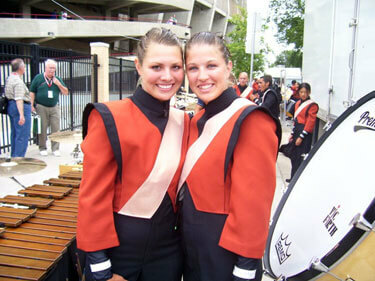 This picture is from Ashley Briar, a 2006 member of Mandarins. My name is Ashley Briar, and I am a junior at California State University Stanislaus where I am studying music education. I was in the 2006 Sacramento Mandarins front ensemble. This picture is of me (left) and Stacey (right) before our World Championship Semifinals performance. Everyone thought we were either twins or sisters all season. Someone even asked us if we were related during a pre-competition warm-up!